Munich - Italy, Austria and Switzerland have been the destinations of choice for many Bundesliga clubs as they prepare for the new season, but there have been some who have stayed a little closer to home. Warming up in comparatively cooler climes and thus avoiding the incapacitating summer heat is one reason, while another is the opportunity to rest, relax and recharge the batteries in tranquil surroundings in preparation for the rigours of another season. At the end of the day, though, what counts is the hard work. FC Bayern Munich spent eight days on the banks of Lake Garda, at the foot of the Dolomites, returning there for the fourth straight season. Given that two out of their previous three visits did not lead to any trophies, superstition cannot be behind their decision to return, even if they did lay the foundations for last term's treble in northern Italy. "Conditions could not have been any better"
The record German champions were not the only club to wax lyrical about the facilities on offer in Trentino. Italian giants FC Internazionale, SSC Napoli and former Bayern striker Mario Gomez’s new club ACF Fiorentina followed, while Dutch club Feyenoord also made it their home. Bayern and Dortmund are now back on home soil, which Borussia Mönchengladbach and VfB Stuttgart never even left. 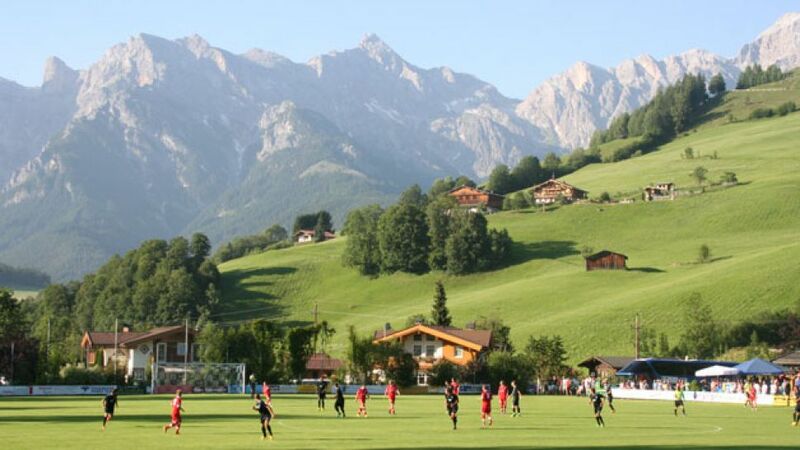 The Foals travelled to Bavaria, where they return for the opening fixture of the 2013/14 season on 9 August, while Stuttgart remained even closer to home in Donaueschingen, after spending their first three weeks in familiar surroundings at their habitual training ground. Whatever the choice for pre-season, it is a crucial time of the year for all clubs, even if no points can be gained directly from it. Shedding extra pounds after the summer break, integrating new faces and meticulously building up fitness levels to hit peak form in time for the first competitive match of the season are what really count. The choice of opposition for friendly matches is also anything but random. Building up confidence with gala performances against amateur sides to begin with, only to steadily increase the calibre of the opposition to match the improved condition of the players is the ideal path; getting it wrong could have negative repercussions further down the line. Identifying the right camps and selecting the appropriate friendly matches is therefore just as important as choosing the right players. A comfortable and successful few weeks before the competitive action begins could define an entire season, positively as much as negatively.